Place chicken in large, glass bowl or dish; pour buttermilk over it. Cover and refrigerate for 30 minutes. In medium bowl, whisk together flour, cornmeal, salt, celery salt, pepper, paprika and cayenne. Dredge chicken pieces in flour, two at a time, turning to coat all sides thoroughly. Set chicken on a rack and let sit for 30 minutes. In medium saucepan over medium heat, warm butter. Stir in onion, red pepper and green pepper. Stew peppers until soft, about 10 minutes, stirring occasionally. Stir in flour and cayenne. Cook for 2 minutes, stirring often. Gradually stir in chicken broth. Bring sauce to simmer; reduce heat to low and let cook until thickened, about 5 minutes. Add salt; remove from heat and set aside until needed. In large, cast iron skillet add oil to fill 3/4-inch deep. Over medium-high heat, warm oil to 350°F. using kitchen thermometer to test oil temperature. Carefully place chicken, skin-side-down in oil. Reduce heat to medium and cook chicken for 15 minutes until nicely browned. Turn chicken and cook for additional 10 minutes, until internal temperature registers 180°F. on thermometer. Remove chicken and drain on paper towels. Cook remaining chicken in same manner until done. Before serving, reheat sauce and pass separately. 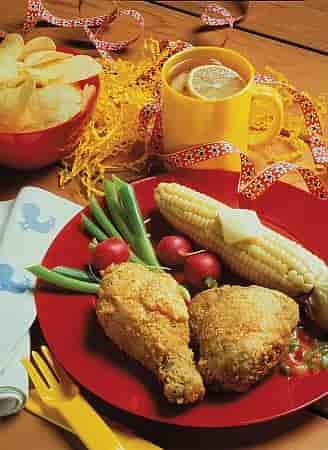 Recipe and photo courtesy of the National Chicken Council. Used with permission.